Top seeds England have been drawn in the same qualifying group as Wales for the 2015 Uefa European Under-21 Championships. 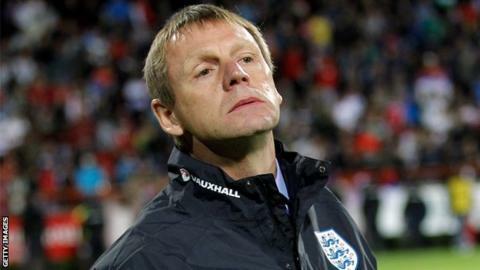 Stuart Pearce's side will also face Finland, Moldova, Lithuania and San Marino in Group 1. The ten group winners and the four best runners-up will advance to the play-offs, with seven teams joining hosts Czech Republic in the finals. "I'm quite happy with the draw," Pearce told TheFA.com. "It's a fantastic draw for us in all honesty, apart from the fact that we are in a six-team group. "That could put us under a little bit of pressure with regards to getting the fixtures in, but when you look at the pots in terms of the other teams and their seedings, it could have been tougher." England's 2015 campaign will not begin until August because of their involvement in the 2013 finals in Israel in June. England qualified for the 2013 finals after beating Serbia in the play-offs in October, and will join hosts Israel, Italy, Norway, Germany, Spain, Russia and the Netherlands in the tournament. Pearce expects a tough test from Wales in their two 2015 qualifying group meetings. "We obviously know the Welsh very well. And Finland, Lithuania, San Marino and Moldova are good teams for us to draw in terms of travelling," he said. "We had a really tough game with the Welsh team a couple of years ago in the play-offs. England beat Wales 5-4 on aggregate in the play-offs to qualify for the 2009 Under-21 European Championship finals. England won the first leg in Cardiff 3-2, with Gabriel Agbonlahor scoring the winner. In the second leg at Villa Park, ten-man England held on for a 2-2 draw after Tom Huddlestone was sent off with 25 minutes to go. "I think they'll be two good games, like local derbies, so in that way they will be competitive as always." The 52 nations in Thursday's draw in Nyon were split into five pots and then drawn into 10 qualifying groups. Scotland have been drawn in Group 3, alongside top seeds the Netherlands, Slovakia, Georgia and Luxembourg. Northern Ireland will face Italy, Serbia, Belgium and Cyprus in Group 9, with the Republic of Ireland meeting Germany, Romania, Montenegro and the Faroe Islands in Group 6. England Under-21s face Sweden on Tuesday in a friendly at Walsall, with new Manchester United signing Wilfried Zaha and Liverpool's Raheem Sterling both set to feature. The Young Lions then face France and Austria in friendlies before the finals in Israel. Group 1: England, Wales, Finland, Moldova, Lithuania, San Marino. Group 2: Russia, Denmark, Slovenia, Bulgaria, Estonia, Andorra. Group 3: Netherlands, Scotland, Slovakia, Georgia, Luxembourg. Group 4: Spain, Austria, Hungary, Bosnia and Herzegovina, Albania. Group 5: Switzerland, Ukraine, Croatia, Latvia, Liechtenstein. Group 6: Germany, Romania, Montenegro, Republic of Ireland, Faroe Islands. Group 7: Sweden, Turkey, Greece, Poland, Malta. Group 8: Israel, Portugal, Norway, Former Yugoslav Republic of Macedonia, Azerbaijan. Group 9: Italy, Serbia, Belgium, Cyprus, Northern Ireland. Group 10: France, Belarus, Armenia, Iceland, Kazakhstan.